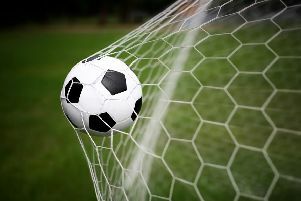 A sloppy start to the match ultimately proved costly as Little Common Football Club lost 5-3 away to table-topping Horsham YMCA yesterday (Saturday). The Commoners were two-down inside 15 minutes, but competed commendably thereafter and scored three goals against the Southern Combination League Premier Division leaders for the second time in three weeks. Common made two changes to their starting line-up, with Jordan Harris coming in for the injured Paul Feakins and Adam Smith given a start ahead of Sam Ellis. Despite passing the ball well during the opening exchanges, Common found themselves 2-0 down and a long afternoon looked on the cards. Both goals came from set-pieces. The first was a header from a corner and the second from a hotly disputed free-kick awarded by the assistant referee, although the Commoners really should have cleared the ball to safety. Common gave themselves a lifeline eight minutes later when Wes Tate’s throughball found Jamie Crone, who outpaced a Horsham defender before calmly rounding the home goalkeeper and slotting into the net. The home team twice saw efforts cleared off the line, with Russell Eldridge and Tate both coming to the rescue following neat play from the Horsham front line. Common almost grabbed an equaliser when Ryan Paul’s goalbound header from a Tate corner was saved by the feet of the Horsham stopper. The hosts broke to add a third goal when a clever run into the box was followed by an exquisite chip over the advancing Matt Cruttwell. Once again Common gave themselves a lifeline when Lewis Parsons’ lofted delivery into the box from just inside the Horsham half deceived everyone, including the goalkeeper, and found its way into the top corner. With just a one-goal deficit at the interval, the Commoners had everything to play for in the second half and began positively. But a fourth goal for the hosts on the hour seemed to prove decisive, with Horsham going on to enjoy long spells of possession as Common became a little wasteful. Cruttwell made a good save from a shot inside the area, while two further efforts cleared the crossbar. Horsham added a fifth goal 10 minutes from time following another set-piece. The Commoners completed the scoring in the dying minutes when a Jordan Astell effort took a deflection and looped over the home goalkeeper. Common: Cruttwell, Paul (Ryan), Harris, Ward, Parsons, Eldridge, Tate, Pool, Hole, Crone (Astell), Smith (Ellis).